HorsePlay Punta Cana, Horseback riding and zip lining along the river in Punta Cana. 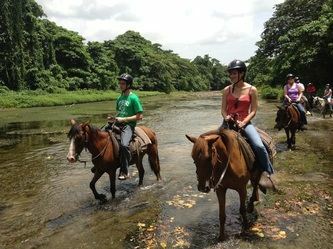 Now while vacationing in the beautiful Dominican Republic you can experience a horseback ride with the same quality horses and guides as at their sister ranch, HorsePlay Niagara. (Short review of Niagara horseback adventures is below the Punta Cana review). English / Spanish speaking guides will take you on an adventure along the mountain river just a short drive from Bavaro and Punta Cana. Back at the ranch get your adrenaline pumping as you soar across the river on zip lines with the most amazing views in the Dominican Republic. Hotel Pick up time between 8 and 9 a.m.
Hotel Drop off time between 3 and 4 p.m. This breathtaking horseback ride travels along the mountain fresh waters of the Anamya River a short drive from your resort in Punta Cana. Canadian owned and operated, this Punta Cana horseback riding adventure provides you with well trained and well cared for horses as well as friendly bilingual guides to make your horseback riding the highlight of your vacation to Punta Cana. Following the winding river you will visit local village, local store (colmado) to get a cold drink, and play a game of pool if you like. You will see a local way of life, out of resorts. The horseback ride follows the beautiful Anamya River with a lot of opportunities for great photo shots. Going to a mountain path and coming to a small village with cigar plantation, taking a break with cold drink and traditional hand made cigars rolled right in front of you. There are plenty of opportunities for some speed if desired on your horseback ride, or you can take the relaxed route with just walking or trotting. Each and every ride is customized to the level of rider experience. After all fun activities and riding, lunch is ready – Dominican feast for you to enjoy, complete with coffee fresh from the ranch. Wide variety of local recipes cooked and prepared to meet Canadian standards for a meal that will be sure to please even picky eaters. After the lunch you can enjoy on the sun by the pool or to lounge in one of many hammocks. When your meal has had a chance to settle, get your adrenaline pumping as you soar back across the river on our super safe and fun, double cable zip lines viewing the gorgeous scenery from a different perspective. Horseplay Punta Cana professional guides will instruct you and assist you through every part of your zip line adventure. You can go as many times as you like or if you prefer, you can remain at the ranch and take photos of others. It’s your day, have as much adventure or relaxation as you like! After Zipline you will experience a tour of the many varieties of plants found on ranch including cocoa, coffee and vanilla. You will learn how cocoa is processed and of course, there are plenty of samples to try and taste. All of this makes for a complete day of adventure and learning in the Dominican Republic in a safe and friendly environment. This horseback riding, zip lining and swimming tour will be the highlight of your Punta Cana vacation. If you are looking for a horseback riding vacation in Ontario, HorsePlay Niagara will deliver a trail ride adventure you’ll never forget. horseback riding and trail riding are their specialty. What is separating them from the crowd are numerous locations, beautiful terrains and specialized trail ride packages suited for the best experience, carefully prepared for specific occasions and age groups. Adventure Beach Ride – 2 hour horseback ride travels along the beautiful Niagara, Ontario trails and along the beach. Romance Package – great romantic evening or a great honeymoon package, with a guide who will do everything to make your ride an enjoyable and romantic experience. Engagement Package – romantic evening tour roaming around the woods, ponds and abandoned quarries and down along the beach. Private ride, just two of you and the guide. Group Package – Trail Riding for Large Groups like scouts, corporate, gatherings, reunions etc. A discount of 10% applies to all groups arriving with 10 or more riders. Winter trail riding – There is nothing more exhilarating than to ride a horse through the fresh snow. View the winter wonderland in a way you have never before experienced. Kid’s Rides – Children six years and up are welcome to go on our regular trail rides riding their own horse. School Packages – HorsePlay Niagara Inc. offers a variety of school packages based on your class’s individual needs. Combining farm education with some good old-fashioned fun, there is plenty to appeal to every age group for your school trip. Group Package – fun and exciting packages for Scout Groups, Camps and Church Groups. Play at our Playground, barnyard nursery and mini-golf, Enjoy a Pony Ride lead by our experienced staff, all you can eat hot dogs, pop and chips (small fee per person). Birthday Parties – Parties include the use of our outdoor play areas, mini golf and our picnic area. They have an outdoor playground, Barnyard Nursery petting zoo, (summer months only) and mini-golf. Parties run rain or shine. Day Camp – Imagine riding horseback out on the trail with your new friends through water, bush and breathtaking views. Back at the farm you’ll play games in the pool, Putt in the Mini Golf or play tag with your new friends. With games, crafts and tons of fun throughout the day.